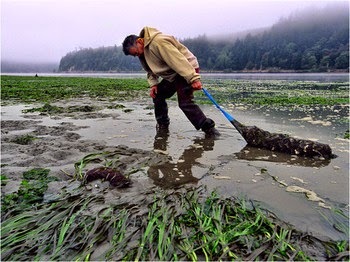 Increased concentrations of CO2 can cause significant changes in marine organisms due to ocean acidification. A more acidic environment has a dramatic effect on calcifying species including oysters, clams, sea urchins, corals, and plankton. When shelled organisms are at risk, the entire food web may be at risk. It is estimated by the end of the century surface waters of the ocean could become 150% more acidic. Senior NOAA scientist and UW Oceanography Professor Dr. Richard Feely will discuss present and future implications of increased CO2 on the health of our ocean ecosystems and ocean-based economies. 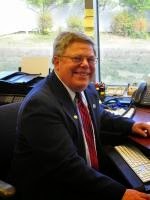 Dr. Feely received the 2010 Heinz Environmental Award and is a lead participant on the Intergovernmental Panel on Climate Change, which received the 2007 Nobel Peace Prize in collaboration with former Vice President Al Gore. No-host reception immediately following the lecture. Curious about these mysterious opalescent egg casings? So were we! 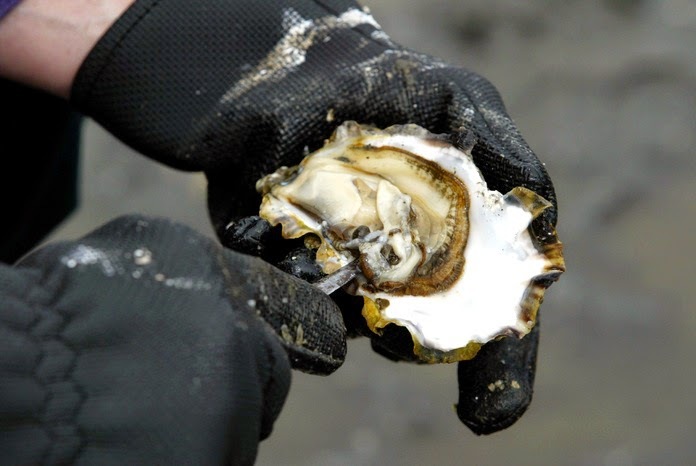 On the morning of December 7, 2014, Fort Worden's Ranger Todd found them on his crab pot. Citizen Science Assistant AmeriCorps member, Ashleigh, decided to document the development of these Loligo opalescens, California Market Squid, eggs. 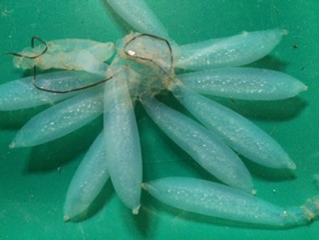 Typically laid on sandy or hard substrates on the seafloor bottom, California Market Squid eggs hatch in 3-5 weeks but may require longer in colder water. Over the course of the first 26 days, the eggs slowly transformed from circular yolks to more distinct shape. Day 31 brings the initial development of the eye stalks which are then followed by rapid developmental changes. In the Day 45 photo, one can note the eyes at the base of the mantle, the external yolk sac has decreased in size, and the rapidly developing chromatorphores. These chromatophores, or pigment spots, can be contracted and expanded to allow adult squid to turn from a transparent white to an opaque red-brown. Day 53 shows the yolk sac almost completely gone and the chromatophores expanded. Finally, Day 55 brought us the moment we have been waiting for! Several 'squidlets' (non-technical term) have hatched! The hatching of the paralarvae from each capsule was staggered over several days. One can observe in the final 'Post-hatch Egg Capsule' photo where the juveniles emerged from small slits in their chorions. Using powerful contractions from their mantel, the squidlets entered the waters of our beautiful Salish Sea, fully capable of rapid movement in any direction and sustaining themselves on the remains of their internal yolk sacs. Check out this link to see a video of a squidlet mobilizing for their grand entry to the Salish Sea! You can see the rapid movement of the mantel and changing chromatophores, both essential for life in their abundant and diverse ecosystem. Thank you to Ranger Todd for sharing these eggs with us back in December! 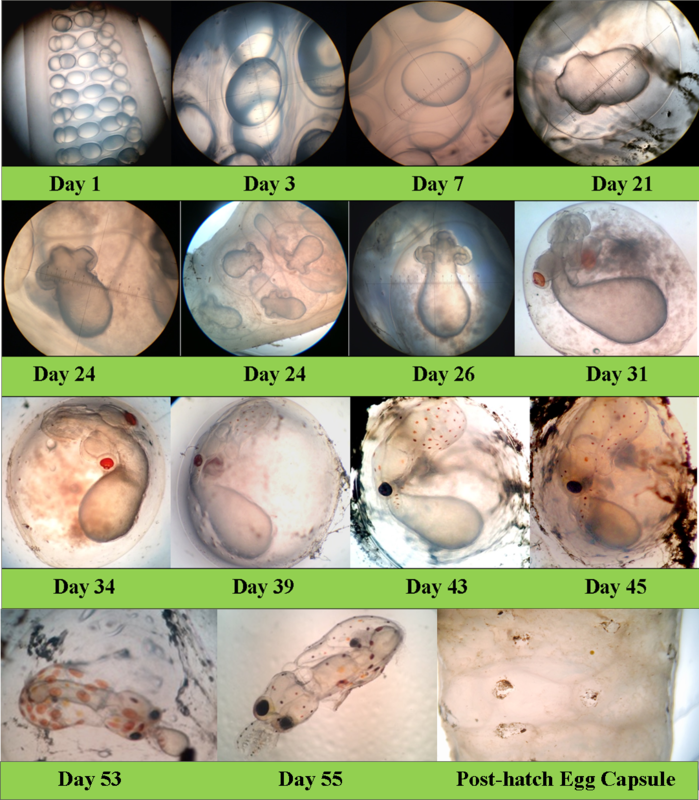 While our eggs took approximately three weeks longer to hatch than the expected 3-5 week gestation period, scientists have noted that development is delayed in colder water. Let's keep stunning creatures like the California Market Squid in mind and continue to inspire conservation of the Salish Sea together! Feel free to contact Ashleigh (apilkerton@ptmsc.org) if you have any additional questions! No comments: Links to this post Labels: americorps, animals, babies, citizen science, collective action, conservation, Critters, Gone Green? Go Blue! Off the southwest coast of Greenland, artist Maria Coryell-Martin (expeditionaryart.com) and scientist Dr. Kristin Laidre recorded the effects of sea ice loss on narwhals and polar bears at Baffin Bay. While scientists observed their health and movements, Corywell-Martin illustrated the environmental and scientific process with a captivating human touch. “We are fortunate to host this incredible lecture presentation,” said Marine Science Center Executive Director Janine Boire. “We want to inspire communities to work together for the health of our oceans and it starts with building awareness. Imaging the Arctic is a perfect example of marrying art and science to communicate the effects of climate change on native species.” Climate change, toxics, and plastics are the main foci of PTMSC’s Gone Green? Go Blue! Campaign to raise awareness and inspire collective action to improve ocean health.